Game changer! I have heard this term used in education twice. The first time was from Persida Bujdei. She came into a peer observation group and was ecstatic about the power of AirPlay. She was right on the implications and power of AirPlay. AirPlay continues to be a game changer! The second was from Rachel Barry. She came in after using Classkick for the first time. Game changer was all she said. After using it, I cannot say enough on how much of gamer changer Classkick is. Click here for the website. The website automatically plays an overview video that provides functionality of Classkick. It is an amazing tool! The user can upload any pdf or image into Classkick. Classkick also connects with Google Drive. Any images or pdf already in Drive can be selected. Once uploaded, the user easily can select any part of a pdf. From Rachel's remark, I quickly created a lesson using Classkick. The lesson focused on the analysis of evidence and student writing. 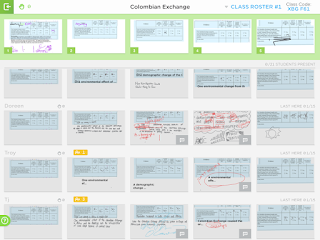 The power of Classkick lies in the instant feedback it grants to the students and teacher. The teacher can select any student and view their work in real time. The teacher can comment on the information and the student receives the feedback in real time. IN REAL TIME! Since it is in real time, the feedback is immediate. In the above image, the student wrote, "In both places." I circled which places, and then they inserted Europe and Africa. The whole process took less than thirty seconds. Since it was so fast, the student's learning progressed quicker than ever before, because they received almost instant feedback while in the writing process. The above image is the teacher's view. The teacher can easily see the progress of all students. 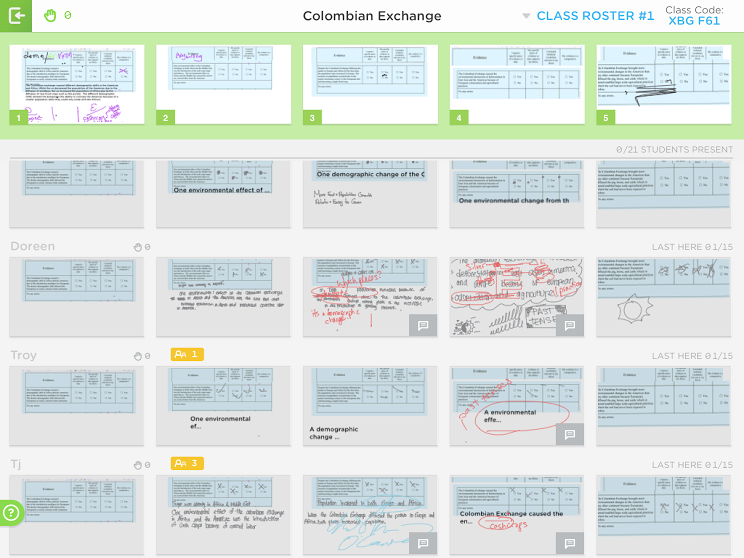 The teacher can click any square for a zoomed in view and the ability to provide feedback. A great part of this view is just watching students think and express themselves in real time. You don't have to be right next to the student, which allows students a degree of normalcy when writing. Furthermore, the teacher can display any work via AirPlay. Therefore, if a student writes something that is worthy of showing to the whole class, the teacher can easily display the work. The great thing, the teacher can display multiple student examples very quickly because of the central location of the work. The student's work above shows their writing in purple and the teacher's feedback in red. The black is another student's feedback. That's right, the teacher can enable student to student feedback. And the student to student interaction occurs in real time! The student can click on the hand icon in the upper left hand of the screen. Once raised, teachers and students can help the person with the raised hand. Students can only help another student if the hand is raised. They can then comment. The primary user can always delete any comments written by the teacher or another student. Students can work ahead if needed. Also, students can work on the task after the class ended. The last bonus I will raise, is the work is saved for later use.